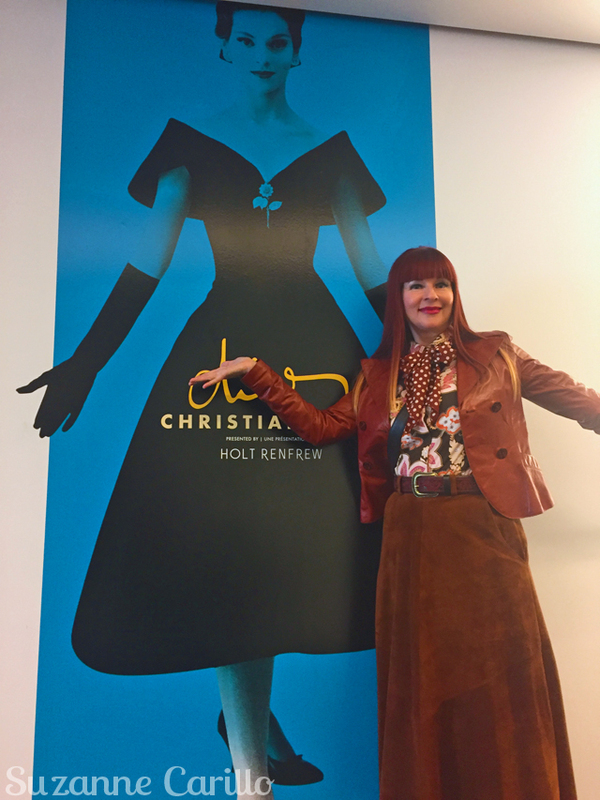 I recently had the opportunity to take in the Christian Dior exhibit at the Royal Ontario Museum and thoroughly enjoyed myself. Dior’s parents envisioned a diplomatic life for their son however Christian’s interests were in architecture and art. He briefly owned a successful art gallery which collapsed with the Great Depression. Afterwards, to make ends meet, he sold his fashion sketches and eventually landed several jobs with design houses allowing him to perfect his designing skills. At the age of 41 Christian Dior chose to open his own design house where he revolutionized and dominated the fashion industry for a decade. He was one of the first to grow his brand through licensing deals of perfumes, stockings, accessories, jewellery, shoes and handbags. He died at the early age of 52 from a heart attack. 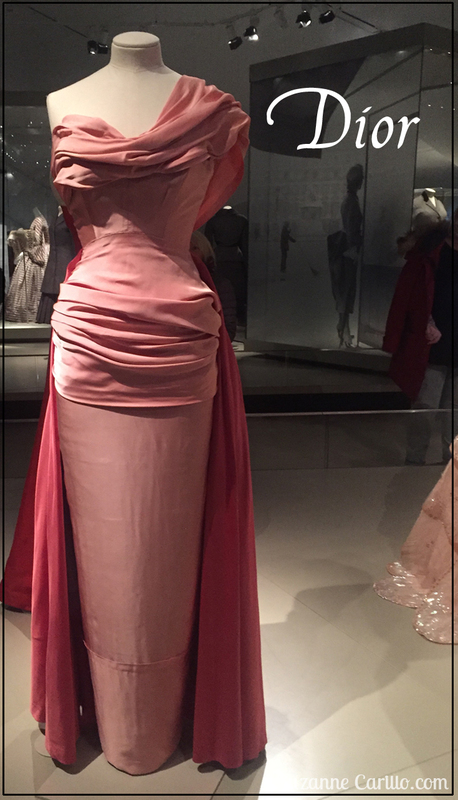 What I found extremely interesting in this exhibit was how Dior’s sketches were left open to the interpretation of the flou (dressmaker) or tailleur (tailor). These geniuses were truly able to see beyond the mere sketches before them and interpret the dream. Some of the sketches were so vague I marvelled at the details of the finished gowns. The imagination and skill level of the team members and artisans required to realize these visions was astounding. Specialists were brought in to do beading and embellishments. Every piece Christian Dior designed was given a name. The year and the season were often woven into the label. Each collection had between 150-175 designs suitable for all times of the day. I noticed that often they were marked, morning dress, afternoon dress, early evening dress, dinner dress or late evening dress. Apparently you were expected to change four or more times a day. 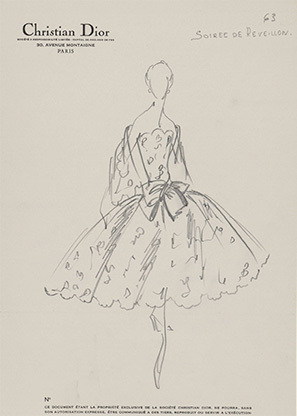 Each sketch was assigned a head seamstress or tailor to interpret Dior’s sketches and turn them into reality. Every dress was designed for one in house model to her exact measurements and only she modelled that particular dress. Once the dress was completed all items such as fabric and trims were recorded. 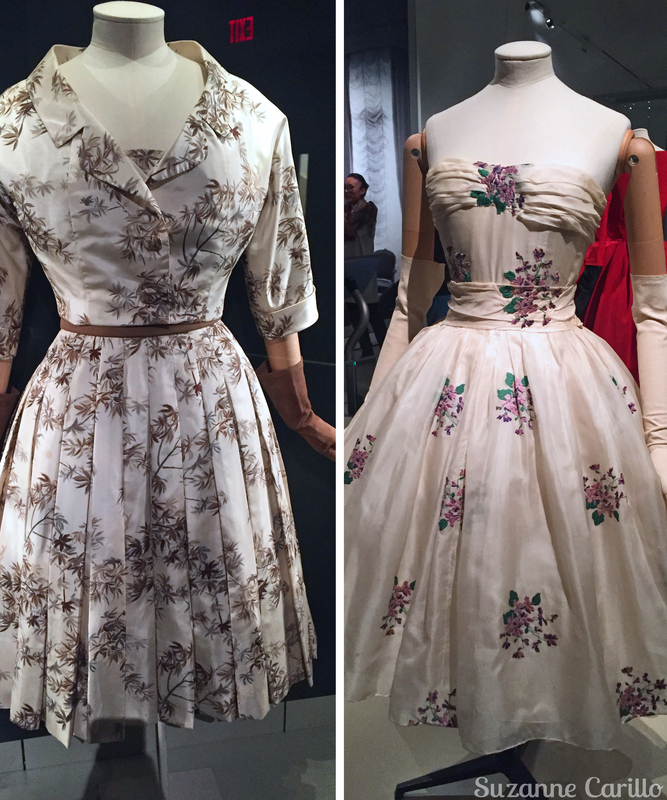 Each one of Dior’s designs were made to order so you could choose the fabric and trims to personalize your dress. I created a thrifted outfit inspired by Christian Dior. Everything I’m wearing is vintage. 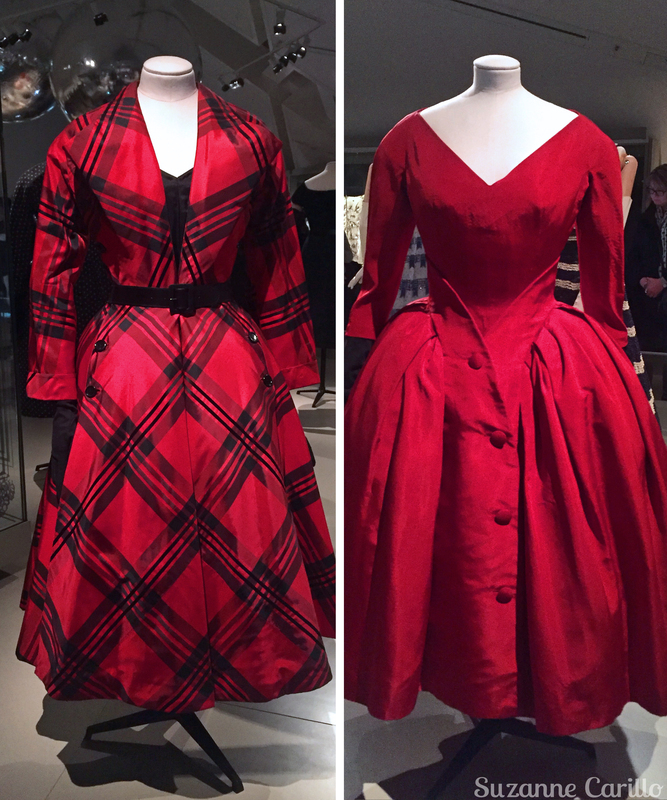 The tight fitted jacket with overstated puffy shoulders and the fuller skirt is reminiscent of la Belle Époque which was Dior’s inspiration for many of his deigns. My 1980s’s jacket is embroidered with floral flocking. 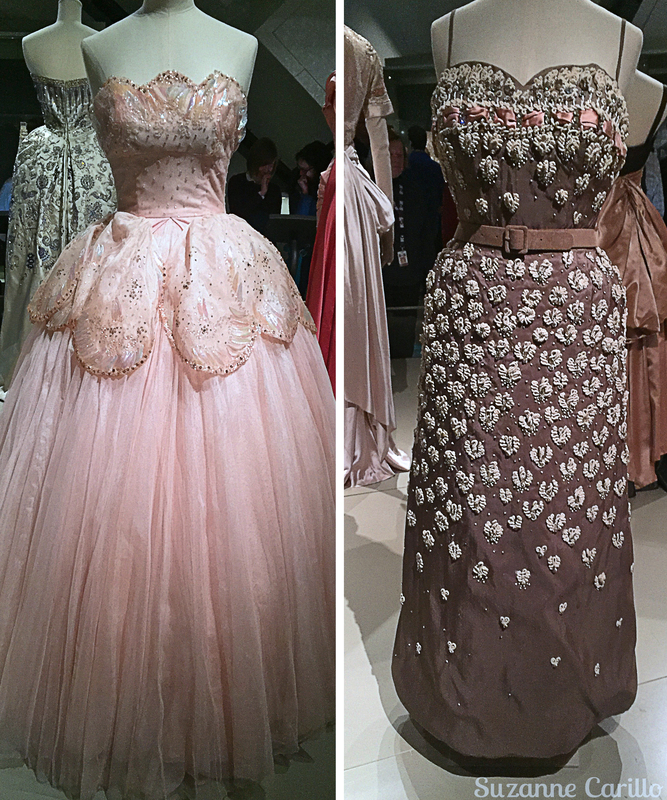 Dior was partial to embellished pieces. Are you a fan of Dior? When I posted that jacket on my IG so many people thought it couldn’t be worn contemporary ; P It was part of a suit. WOW those are some gorgeous designs Susan. They suit your flair for retro styles. Looking great too. Thanks for stopping by Ada. 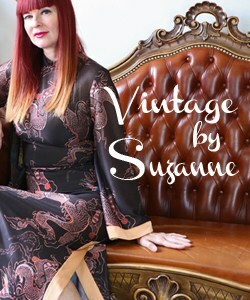 Yes, I am a huge fan of all vintage clothing, so much more character than any contemporary clothing. What a fabulous and interesting post to read about Dior’s history. How wonderful to know he worked with such a skillful team, that must have been a magical experience for all involved. These pieces make me what to travel back in time! You would have loved this exhibit Elle! Isn’t that hat sweet? I picked it up at an online estate sale. 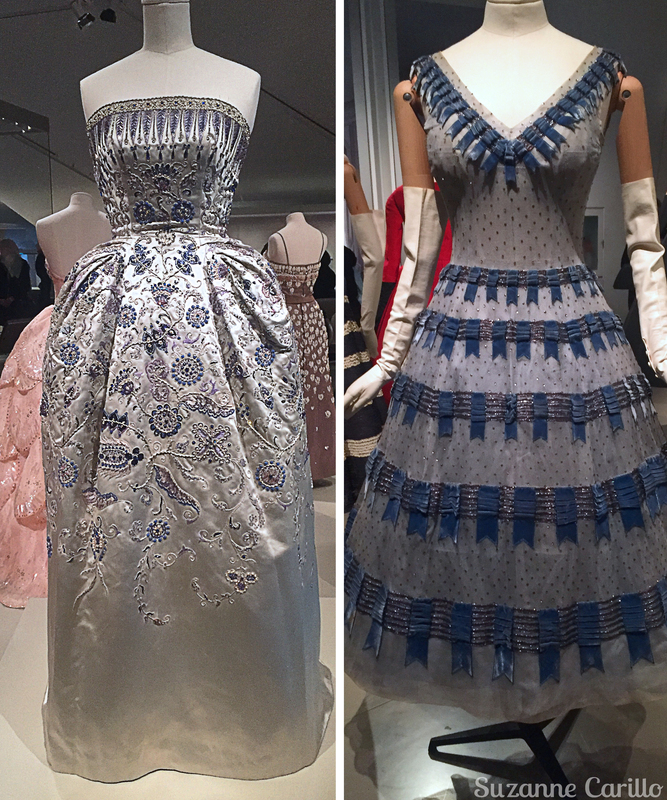 I’m so envious that you were able to see his exhibit – his dresses are exquisite. I’m currently reading a historical fiction book about Dior set in Paris (of course) and it’s so good. Love the outfit you created – perfection! You would have loved this exhibit Lana. The craftsmanship of the dresses was unbelievable. What is the title of the book? I might need to pick that one up. your interpretation of the dior look is trés chic! super sweet jacket! thank you for taking us with you – this robes are awesome. It is incredible to see that he accomplished so much in ten short years. I had no idea he started so late and died so young and yet the brand continues to flourish. You Dior style is very worthy. I love that jacket. 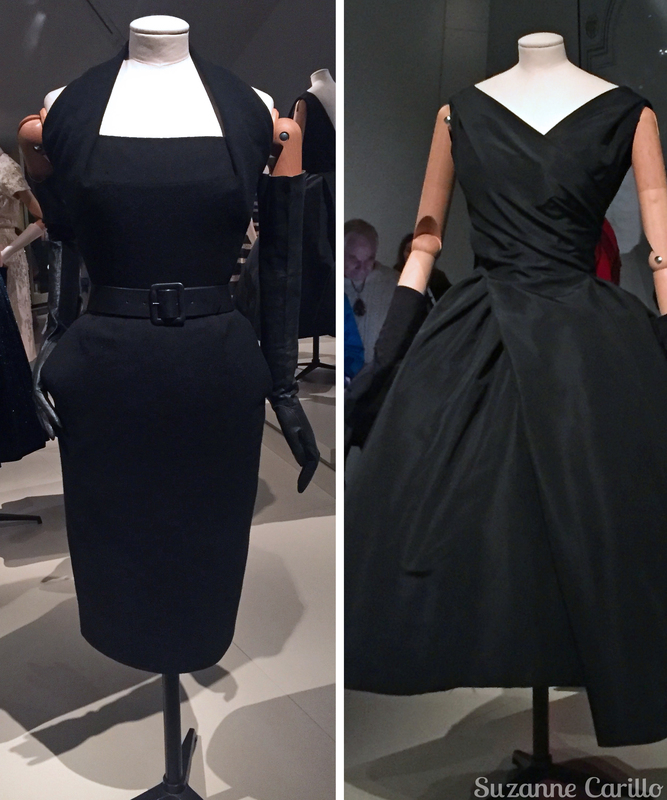 I am interested in the way Dior collaborated with his head seamstress or tailor. It reminds me of a director and an actor where the director lets the actor run with a character. I love that freedom, and clearly Dior’s method worked. I like old movies where buyers were given private shows, such as How to Marry a Millionaire. This looks like a fantastic exhibition. I was stunned to find out that there was so much freedom within the creation of the dresses. Most creative people are very meticulous about what gets added or subtracted from their designs. He was clearly comfortable with his team knowing they would only improve upon his original ideas. How amazing to be able to see this exhibit, Suzanne!! You learn so much about the designer this way, and how incredible they truly are. Yes, going to something like this is really eye opening. I have so much more appreciation for his skills and business abilities now. When I had my other business (designing scrapbooking and crafting materials) I knew other designers that would change three times a day at trade shows, just to show off all their clothes and great style sense. Often times as a designer, no matter the industry, you are selling your personal image along with your designs. What for a great exhibition and he was really a genius! Died so early! I loved that women could choose the embellishment and he left sketches open to the imagination. I liked that the year and season were on the dresses and a collection of a 150-175 pieces, to change 4 times a day, wow 🙂 Loved your vision of Dior, the vintage pieces you put together! I have some Dior pieces, but not any fabulous vintage dress. Jackets, bags, brooches and makeup/perfumes. I would loooove to have a floral dress you showed! Hope you enjoy a lovely week, hugs! 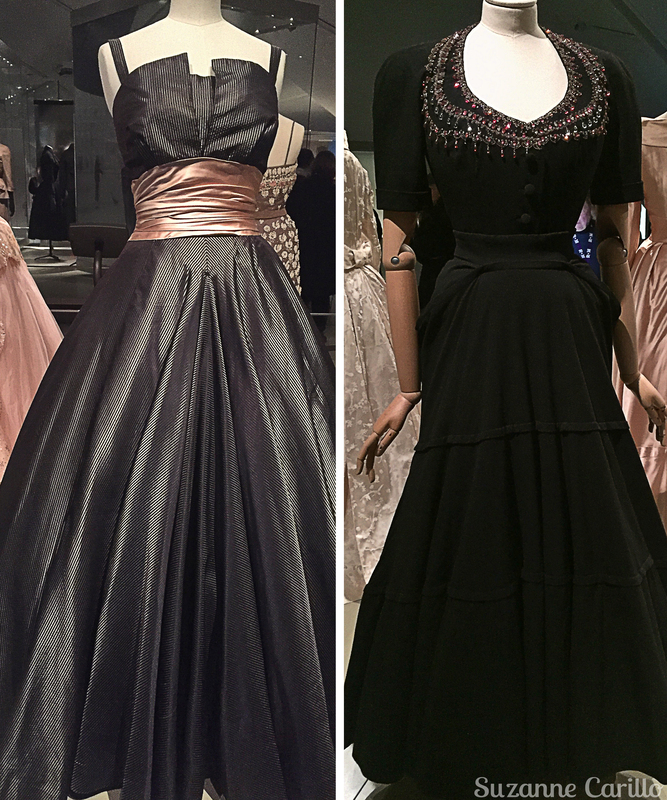 It was very interesting at this exhibit because many of the dresses were donated to the museum by the original owners. They often had photos of the owners wearing the pieces. You are very lucky to own some original Dior pieces! Fascinating designs! I’m spending an unusual amount of time studying (ok, ogling) these. Thanks for showcasing them. 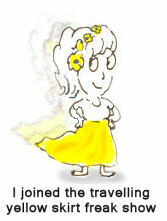 I benefit from your interest in and knowledge of fashion. Like our recent trip to an exhibition where I learned about Canadian fashion. The longer I hang around you, the smarter I get! What a fantastic exhibit! Would love to just touch those dresses! Yippy look very,,Diorisch,,! I loved your Dior interpretation especially the hat! That hat is one of my favourites picked up at an online estate sale. Clearly, Dior had a profound respect for those who actually brought his designs to fruition. This strikes me as revolutionary thinking but perhaps he was a practical visionary and recognized that although he was the primary architect of the designs, those who sewed the garment would gain unique insight from the construction process that could benefit the finished design. What a wonderful exhibit! You were obviously very inspired because the outfit you put together is very beautiful and your facial expression and demeanor in these photos seems especially elegant. Am I wrong? I loved this post Suzanne! I think once I put the clothes they had a transformative effect and took me back in time a bit. I also believe that Dior’s skills were not in the construction of the garments. He was an artist and the idea man. That’d be the only kind of designer I’d be, all the fun and none of the frustration. The styles and silhouettes actually varied more than I thought. Some interesting embellishment ideas too. I love that brooch and scarf on hip pocket idea. Tres chic! He changed up his styles every year. He was a creative genius. You did so well! Very Dior indeed. I like Dior a lot but it is so out of my reach. Both in price as in use. 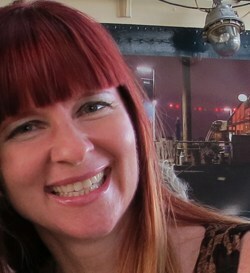 Love the quote “pin a brooch with a coloured chiffon scarf to the hip pocket of your suit”. I am going to use that! Oh how I would have loved to see this exhibit. Your photos of his dresses are stunning. I would be thrilled to have any one of them. Only in my dreams unfortunately. It really is a treat to be able to view such exquisite workmanship. And I love your Dior inspired outfit, You’ve really got that “New Look” thing going on in a big way.